Though it can be fun to bargain and barter at market stalls, you don’t want to cut costs when it comes to booking accommodation for a trip to South East Asia. Thailand, Malaysia, Bali, and Vietnam are countries renowned for their beauty, in scenery, temples, and culture. So if you’re planning a trip to the orient, don’t miss out on these exquisite boutique hotels and the interesting sights to see in their surroundings. 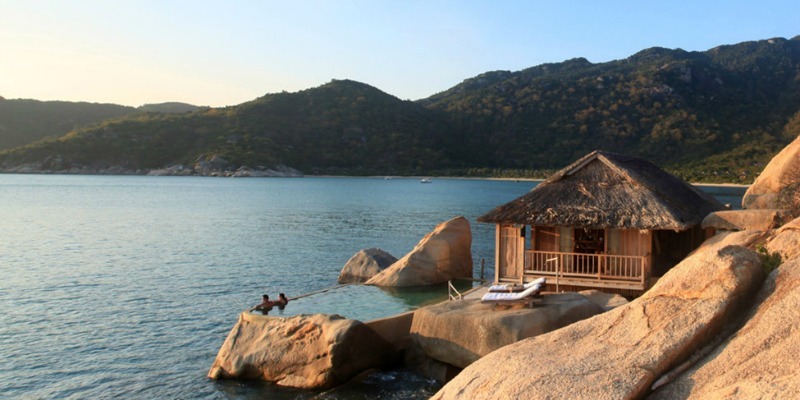 With thatched roofs, natural building materials, and beautiful décor, Six Senses Ninh van Bay is a dream come to life for eco-lovers and outdoor fundis alike. Though made from natural materials, every comfort is catered for, and the dining options available offer a choice between fine-dining at the restaurant, or a secluded romantic dinner for two in the wine cave. Hiking and biking trails abound in the lush area, and a plethora of watersports in the crescent-shaped bay include everything from kayaking and sailing, to windsurfing and water skiing. If you choose to go fishing, bear in mind that anything you catch can be cooked at the resort! All rooms offer outstanding views of the area, so choose between Beachfront Poolside Rooms, Hilltop Villas with a pavilion and swimming pool, Water and Rock Villas reachable only by boat, or for honeymooners, the luxurious Presidential Suite with a private dining area, and butler. Nearby Activities: The Long Son Pagoda at the nearby city of Nha Trang, is home to the 24m high White Buddha, and the detailed mosaics and carvings, found in and around the pagoda, are incredible to behold. With charmingly staggered rooms set on a hillside slope, the Banyan tree Samui provides a stylish stay that is an easy journey from the airport; and culinary connoisseurs will delight at the variety of gastronomic treats available at each of the three on-site restaurants. With a unique hydrothermal experience available at the spa, as well as a Swiss shower and rain walk, you’ll easily forget any tension you may have brought with you; but with a library, fitness centre and pool available too, you can choose to unwind however you please. Families are well catered for with a Kid’s Clubs to keep youngsters entertained. All rooms have views of Lamai Bay, along with sundecks and infinity pools, as well as living rooms, air-conditioning, and beautiful Thai décor. The Deluxe Pool Villas are set within lush gardens, Ocean Pool Villas have views of the sparkling sea, while Hillcrest Pool Villas are located on the top tier of the resort, and provide views of the surroundings as well as the ocean. Nearby Activities: The nearby Coco Splash Waterpark makes for a day of family fun, and there are numerous diving institutes in the area for those who’d like to explore the world below the warm ocean waters. Though Robinson Crusoe had a tough time on this secluded island, you’ll love the freedom and pampering available at Pangkor-Laut Resort. After a boat ride whisks you over azure waters, you’ll disembark on shore and explore your new home, which is surrounded by a 2 million year old rainforest and fringed with palm trees. Tai-chi, yoga, and the on-site spa will certainly help you unwind, though with island hopping, fishing, jungle adventures, and facilities which include tennis courts and a fitness centre, you’ll have plenty of reasons to want to stay active. 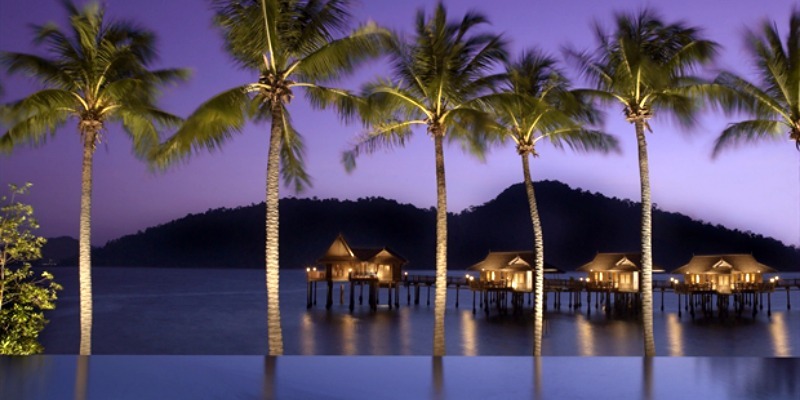 Accommodation at Pangkor-Laut Resort consists of bungalows, each well-spaced for privacy. All that’s left to do is choose your view, be it on the beachfront surrounded by water, nestled in manicured gardens with tropical plants, cloistered within the hills that are surrounded by trees, or within the gorgeous spa village. The outdoor hammocks outside each room are perfectly suited for enjoying cocktails, reading, and afternoon naps. Nearby Activities: Though Kuala Lumpar is 4 hours away, within its business hub you can photograph the Petronas Twin Towers, the tallest twin towers in the world, or explore the fascinating Batu Caves. If you have time, you can head to the Sunway Lagoon theme park to view wildlife shows and go on waterpark and amusement park rides (the park is closed on Tuesdays). If being on a private island doesn’t take your fancy, why not head to the mainland and stay close to the airport whilst remaining removed from the noises of the city? 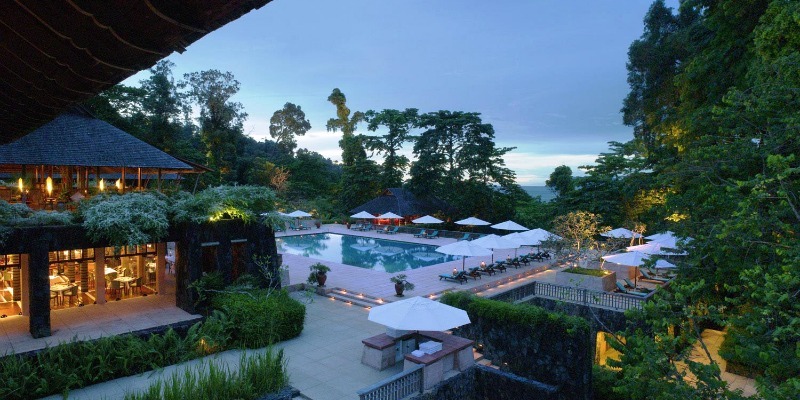 The Datai – Langkawi Resort boasts views of Langkawi’s Datai-Bay and tropical trees, you can enjoy a break from the norm with some R&R at the spa, or spend a tranquil day out on the pristine beach front and possibly spot some otters. Your regular workouts needn’t suffer as with a fitness centre, golf, a personal trainer, and mountain bikes, you can exercise in the manner you choose. Once you’ve worked up an appetite, sate your hunger by trying some traditional Malaysian and Thai dishes at the restaurant, or order one of their international dishes if you’re after some familiar cuisine. Spacious rooms provide king-sized beds and air-conditioning. Deluxe Rooms are set within the main building, Premium Rooms have views of the rainforest, and Superior Villas come with terraces, daybeds and dining areas. 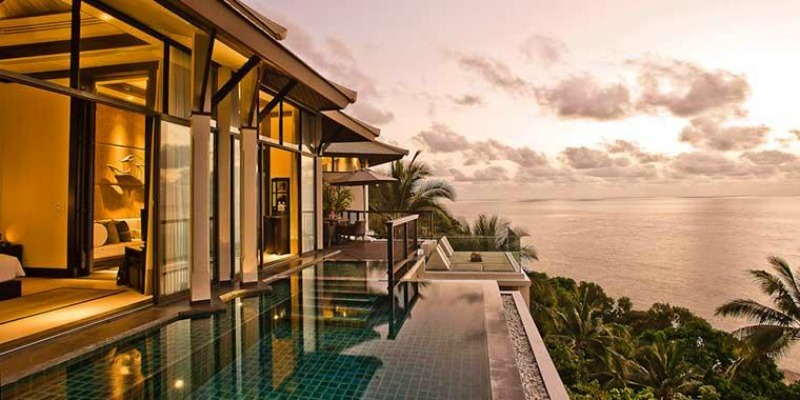 There are also Pool Villas which have plunge pools and private Jacuzzis. Nearby Activities: The Atma Alam Batik Art Village in Padang Matsira, 30 minutes away from the resort, is worth visiting to view Batik artworks being crafted, with garments and wall hangings available for purchase at the shop. Classes are also available for those interested in learning this unique technique. If Indonesia is your destination of choice, then Alila Ubud will meet all your needs. 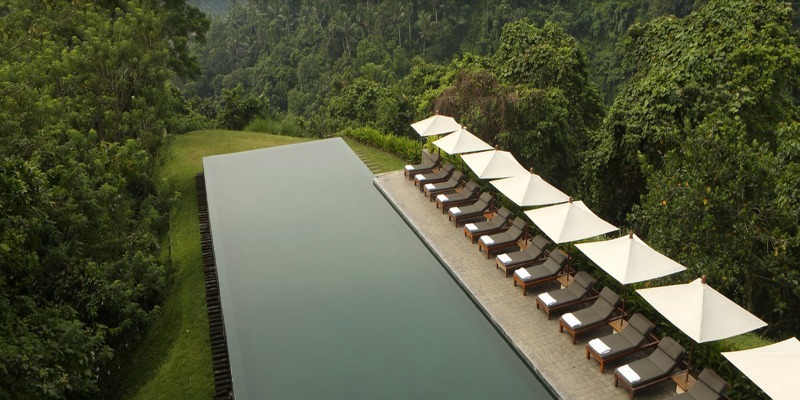 This gorgeous haven is nestled within Ubud in a secluded spot above the valley. With a truly incredible infinity pool, a boutique with fashionable items, an art gallery filled with gorgeous pieces, and two restaurants to choose between, any cultural vulture will feel right at home. The rooms all offer truly stunning décor, complete with comforting dark wood and crisp white furnishings. 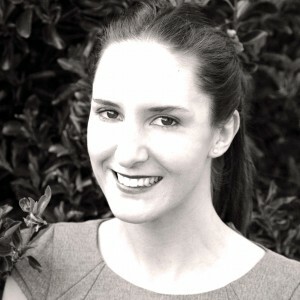 You’ll want for nothing during your visit here, as the friendly staff are on-hand to assist you with whatever you require. Superior Rooms provide views into the valley, Valley Villas offer unique floating bathtubs, while Pool Villas are set within landscaped gardens. The Deluxe Rooms have a refreshing outdoor shower, along with private garden terraces. Nearby Activities: The gorgeous Taman Ayun Temple is royal building from the Mengwi Empire, and has numerous courtyards filled with sculptures and monuments, while ponds, bridges, gates, and intricate carvings are also plentiful. South East Asia is full of extraordinary experiences. Come on over and discover your favorite Asia Destination!